You will only be charged once for P&P according to the product with the highest level. All orders over £50 are FREE! 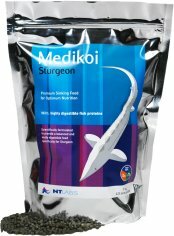 Medikoi Sturgeon is a sinking pellet food that has been formulated specificially for sturgeon and sterlet. Medikoi Sturgeon contains only the most highly digestible proteins, but also provides the correct proportions of vitamins, minerials and oils to ensure your sturgeon receive the best nutritionally balanced food available. Other species of fish in your pond will also find Medikoi Sturgeon highly palatable.